See you later, Charlotte. Hello Bermuda, where the water is turquoise and everything is cute and pink, very Emily oriented. The guys drove mopeds to the resort. Arie joked he had another one-on-one, and I like him even more. Before, Emily came to pick Doug up, he go extremely angry. Thankfully, she showed up and put Doug the Hulk at ease. Arie’s impression of him made me laugh. We learn Doug started a charity, of course he did. Emily says she could never see him grumpy, I love her choice of words. She wrote Austin a note, and no not to Brad, but to Doug’s son. Emily is such a kindhearted person, and then they went on to make a wish. What is it with this season and wishing? To dinner, Emily wears a butterfly dress, which is the most underwhelming dress thus far. She compares Doug to Brad, that is terrible. Doug says his faults are spending too much time with his son and not watching his car enough. Emily says she is sensitive, doesn’t work out (as we all regret our cheeseburger and fries for that day) and wears her pajamas out in public. I guarantee her pajamas are fabulous. Doug doesn’t make the first move, but he sure likes to talk in the third person. Emily looks incredibly disappointed. The producers split my favorites, Sean was on the red team, but Arie and Jef were on the red. Emily states how she hates to watch guys compete, and I start to think she is on the wrong TV shows. Kalon finally gets a date on a sailboat, and he does not dress like a Ralph Lauren poster child. Jef still managed to wear skinny jeans and converses, keeping the hipster style alive. Yellow team prevailed, I guess that is what happens when you have a racecar driver, Jef who sacrificed a finger and one f and good communication. I was sad to see Sean go back to the resort. Poor Chawlie cried on the way back. 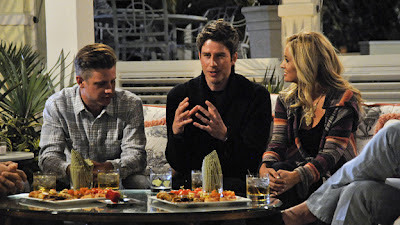 Ryan needs some one-on-one time and toasts to her being a “trophy wife.” Arie grabs her first, their body language is the most compatible. She always looks happy with Arie, and their kisses are insane, in a good way. Good body language with Arie. Jef is a very in depth person, he is more than a head of hair. They have meaningful conversations and have a solid foundation for a relationship. Emily looks slightly disappointed he didn’t kiss her, but she is glad he is making her wait for it. Finally, Ryan gets his time, he has to say he is in depth and mature. Emily reminds Ryan of his Ryanisms. He said it was flirting, and Emily FACEPALMED. You know it is bad, when it comes to that. He proceeds to tell her God made her a beautiful woman, and she told him he was unreal. I wasn’t a fan of the judgmental conversation from him, I personally have no problem with her kissing Arie, or whoever for that matter. Jef, the black horse of the competition. There is definitely a double-standard. I called Jef was going to get the rose, they have a slow burning relationship. I am reminded of Nate’s name, but hey on this show it is better to be unknown, than the infamous character. Dinner is in a cave and it is supremely awkward. Nate seems like a really nice guy, and is missing his family. John has a better connection with her, it is obvious. Nate had an admirable exit, kissed her, and left. He didn’t just walk away, like Joe, or have an extreme breakdown. Alejandro shares his passion and zest for life, he appeared to be on the chopping block, but not in extreme danger. Ryan is oh so confident, because of their relationship. Arie goes in for the steal, time for a race car driving robbery. Arie is a threat, if you have to say he isn’t, someone is trying to convince themselves. Ryan has a chat with Michael ponytail rehab counselor, about how he would like to be the Bachelor. This conversation may or may not have been edited, but who knows. Sean and Emily always have good conversations and kisses. She really likes him, as he does her. He usually brings up Ricki while they are talking, which is a great thing, since they are a package deal. Sean is ready to be with Emily and Ricki. Chris Harrison and Emily chat about the process. We learn, Emily has the best judge of character in this series, so far. She doesn’t take everything at face value. I really appreciate the sass, and her thoughts on the guys. She is not the Bachelorette, we are all setting at home yelling, no don’t do it. Travis (post-Shelly) I think he is a cool guy, even without his beloved Shelly. I was very sad to see Chawwwlie go. He is a sweet guy, and I know he will find a great girl for him. Farewell to Michael and his ponytail. I don’t think she wanted Charlie to get too attached and hurt him more in the long run, and there just wasn’t too much going on with Michael. Seeing Charlie cry in the rain broke my heart. I appreciate the fact, she is giving Alejandro a fair shot. The lack of Kalon in this episode was apparent. No fake glasses, Kalonisms or sly kid remarks. I can’t wait until next week, to see the drama unfold.